The Chief Justice of Nigeria (CJN), Justice Mahmud Mohammed, has said the judiciary remains resolute and committed to upholding its independence. Speaking at the swearing-in of two new justices of the Supreme Court: Amina Augie and Ejembi Eko, in Abuja yesterday, the CJN said all courts in the country are empowered to adjudicate with utmost fairness and justice as prescribed in the constitution and the law. Mohammed said: “We must not forget that we operate a constitutional democracy, which clearly prescribes the powers accorded to each organ of the state. 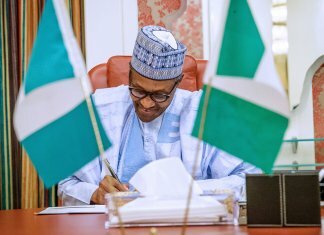 He said the decision of the National Judicial Council (NJC) last week to suspend seven judges accused of corruption, showed the desire of the judiciary to preserve its independence. The NJC made a u-turn last week and took a decision to ask judges being investigated to recuse themselves from official duties after initially declining to do so, arguing that there were no evidence of wrongdoing against the judges. 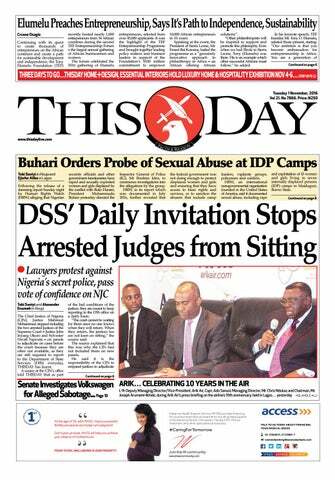 The judges had earlier been arrested by the Department State Services (DSS) for alleged corrupt acts. “Certainly, the decision of the NJC at its last meeting reflects our desire to preserve this independence. “Hence, we proclaimed to the world that any judicial officer standing trial will cease to perform judicial functions. 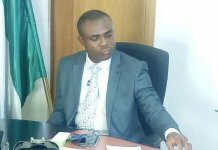 “The council took this stand following communications it received from the Attorney General of the Federation (AGF) that he was embarking on the prosecution of the affected judicial officers for the offences disclosed against them,” he said. The CJN urged the new justices to continue to be diligent in the discharge of their duties. “You must remain blind to personality and status, and remain the hope of all men, whether common or uncommon. “Hence, the integrity and impartiality of our courts must not be in question or compromised. “I am confident that with the institutions and initiatives that we have put in place, the Nigerian judiciary will evolve to meet the high standards demanded by our citizens,” the CJN said. Eko was a Justice of the Court of Appeal, before his elevation to the Supreme Court. Meanwhile, the Peoples Democratic Party (PDP) has urged the justices of the Supreme Court not to succumb to intimidation from any quarters in the discharge of their noble assignment but to ensure that justice is not only done but is also seen to be done. As the Supreme Court gets set to deliver judgment on November 8 on the appeals of Chief Timipre Sylva and the All Progressives’ Congress (APC) against the judgments of the Election Petition Tribunal and the Court of Appeal, both of which upheld the election of Governor Seriake Dickson, the party asked the apex court to ignore the pressure to give judgment in line with the constitution. In a statement issued monday by the party’s spokesman, Prince Dayo Adeyeye, PDP said the judgment of the Supreme Court comes at a time when the Judiciary is facing an onslaught from the ruling party using the apparatus and instruments of state. “This judgment will be given in the face of allegations, by justices of the Supreme Court no less, that senior members of APC and ministers in this administration attempted to bribe judges to subvert the course of justice in similar suits relating to elections in Abia, Akwa Ibom, Ekiti and Rivers States. 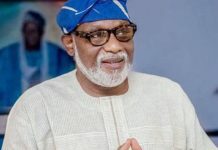 “We are aware that these people and other senior members of APC are, again, putting pressure on Justices of the Supreme Court to pervert the course of justice by overturning the decisions of the Election Petition Tribunal and the Court of Appeal, and nullifying the mandate freely given to Governor Seriake Dickson by the people of Bayelsa State. “We reiterate our belief that the judiciary is the last hope of the common man and the bastion upon which our entire democracy rests. We believe that there are men and women of integrity, with proven track records in the dispensation of justice who ensure that justice is not only done but is also seen to be done. “We urge the justices of the Supreme Court to ignore this pressure and to give judgment in line with the dictates of our constitution, electoral laws and good conscience. “In these trying times when the disregard for the rule of law prevails and there is a deliberate disregard for the constitutional rights and freedoms of the Nigerian people, we call on the judiciary to stand firm against this tyranny.